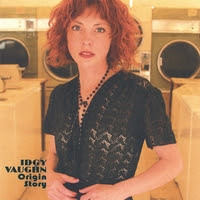 JayeL Audio | Idgy Vaughn: Story of the "River"
Idgy Vaughn: Story of the "River"
Home » Alt Country » Idgy Vaughn: Story of the "River"
Idgy Vaughn is a refreshing addition to the country/folk rock scene by way of Austin, Texas. Pop Candy blogger, Whitney Matheson, expressed her appreciation for Vaughn’s “groovy…wailing” on the outstanding “Red Bone Hound” and after a listen I was immediately hooked. Vaughn’s affinity for poetic story-telling and breathy vocals make for easy listening no matter the topic. She could even be mistaken for Neko Case with matching fire-red hair and an appreciation for folk rock with country influence. If ladies are looking for tips as to how to off a cheating boyfriend, they could learn a thing or to from Idgy Vaughn (she puts the Dixie Chicks to shame). On the mid-tempo cut “Dragging the River”, her voice emits a deceivingly melancholy, innocent tone over the dark premise. She speaks softly and sweetly enough throughout, that you may not notice the haunting subject matter, the vengeful murder of a former lover. Mockingly, Vaughn croons, “Look into my eyes/do I look like the dangerous type?/you’d never tell by these small hands”. Vaughn is effortlessly bewitching over the backyard sound of the banjo and harmonica. Her narrative skills effectively make the listener feel like an accomplice to the crime. After watching the victim plunge into the Mississippi without remorese, she concludes, “No one ever thinks that little hands are capable of much/but in the end these little hands were just capable enough”. Though Idgy Vaughn may claim to have “small” features, her talent is tremendous. Her album Origin Story is in stores now.